Let us take care of bringing you online without any upfront investment and within the short timeframe of a couple of weeks! Start reaching your customers online with HappyFresh! As a grocery retailer, you are the best at managing your store, inventory and products amongst many other things. Let us take care of bringing you online without any upfront investment and within the short timeframe of a couple of weeks! With us you can offer a personal shopping experience and delivery within the next hour to your client. We take care of almost everything! We digitalize your products and list them in our state of the art application, we hire personal shoppers for your customers and take care of delivery within the next hour. We also take care of payment processing. The most important point is: We acquire new customers for you and we do all that without any investment or fixed costs incurred for our supermarket partners. Expanded service offering – online shop, personal shopper and delivery within the next hour! No one is faster than this! 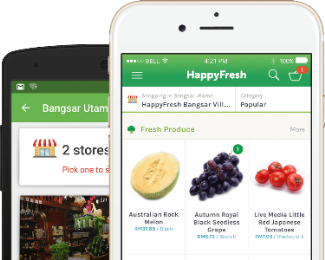 In short: HappyFresh provides a plug and play service for your supermarket – all benefits of selling online without risk!